Frame rate commonly takes a crucial place for video shooting. It gives a great impact on motion smoothness in a video and thus affects viewing experience. GoPro, the expert to film actions, offers a number of frame rate options available to shoot great footages of sports, slow motion, time lapse and so on. But, it's an importance to choose the right GoPro frame rate to make a satisfying production. In this article, we will begin from frame rate explained to GoPro supported FPS and end with tips of frame rate selected. • The all-sided toolbox helps deshake images; denoise audio; trim, crop, merge, rotate video; add effects, watermarks, subtitles and more. • The conversion feature is capable of changing the format from GoPro HEVC/H.265 to H.264 for successful and flawless playback on more devices. • The support of level-3 hardware acceleration allows invoking Intel/NVIDIA/AMD graphic cards to speed up 4K/HD video processing while keeping high quality. Frame rate (frames per second/fps), a frequency term which usually applies to film, television, camera etc, expresses how many frames/images will be shown every one second. When a group of ordered images are presented at a certain speed, realistic, vivid and smooth motion happens. Human eye can analyze 10-12 images per second individually and take it as a motion if higher frame rate is available. 24 FPS is the standard used in movies which can create a cinematic feeling. Higher frame rate than 24 FPS should be adopted if the video contains a lot of movement – like sports, video game – to keep smoothness and make details crisp. On the other hand, higher frame rate results in larger file size for more frames are captured. Which Frame Rates Are Available on GoPro? GoPro allows users to record a video at 24 FPS to 240 FPS depending on the model. Frame rates for NTSC and PAL are defined in order to meet playback requirements in different regions. What’s more, the frame rate will be different on the basis of resolution. In the following, let's have a look at available GoPro frame rates on various models. How to Choose the Best Frame Rate for GoPro Video? It doesn't have an exact standard about the best GoPro frame rate but proper FPS determined by what you want to shoot. Although it is said that higher frame rate can lead crisp motion, too high FPS will result in unnatural look if there is a few moving. In turn, low frame rate probably causes stuttering playback. So, how to choose the frame rate for GoPro video shooting? • 24fps: As abovementioned, films and TV shows prefer to take this frame rate as the best choice. If you try to record a 24fps video with GoPro, it’s very great for a scene without many moving details, for example dialogues in a café, landscapes, silent street and so on. • 30fps: It is the most widely used frame rate when we shoot a video, which is also considered as the best frame rate for online uploading or streaming. Compared with 24fps, it delivers a bit slow-motion effect and smoother details. • 60fps: It is the best choice to record sports videos with GoPro. For fast-moving subjects, 60fps can perfectly eliminate motion blur and present all details crisp. GoPro is designed as action camera and 60fps is the perfect fit for capturing snowboarding, surfing, biking etc. • 120fps: This GoPro frame rate is always used to make a slow motion video. When the subject moves slightly faster, slow motion can reduce the normal speed driving eyes to capture some important details. File size is another factor you should consider when choosing the best GoPro frame rate. Lower frame rate delivers smaller file size which suits for the situation that storage or bandwidth is limited. Higher frame rate helps record vivid footage with fast-moving if you don’t care about storage but need a crisp video. Comparess large-sized GoPro 4K videos by lowering bit rate, frame rate, resolution or trimming unwanted parts. Stabilize shaky image, reduce wind/background noise, correct fisheye, rotate/split/merge videos; add effects/watermark/subtitles on your GoPro footage. 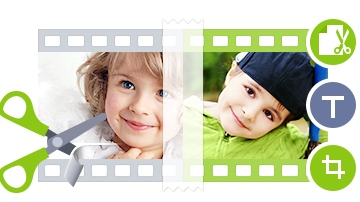 Convert GoPro HEVC/H.264 videos to AVI, MOV, FLV, iPhone, iPad, Apple TV, Android, Windows devices with ease. No.1 fast GoPro video processor supporting level-3 hardware acceleration (Intel/NVIDIA/AMD).